The idea with this improvised Sunday sermon is to take the opportunity presented by this Nissan QX, seen yesterday, to further underline the unsuccessful conclusion of Datsun/Nissan’s efforts to get customers to buy a large car, the kind discussed in this week’s Laurel article. Fourth generation Nissan Maxima or a Nissan QX, depending on market. Some research reminded me that the Maxima is not really the direct heir to the Laurel crown. The Teana is. You probably knew that. The Laurel name died in 2002 and the Nissan Teana took up the baton thereafter. The Maxima’s roots go back to the 1980 Datsun 810 Maxima (as it was called in the US), a cousin of the Bluebird line. After the 1984 successor which was also a Bluebird relative, the Maxima ran on its own platform, moving up a class. The 1988-1994 version seems to be its own car too. 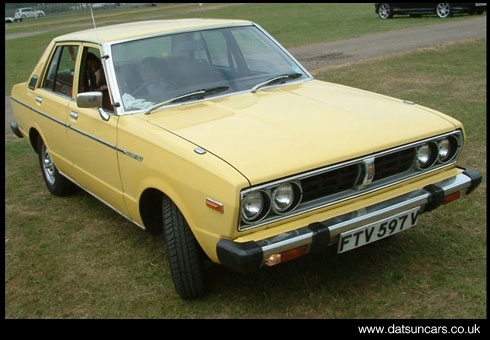 Which brings us to this car (above) which I had thought to be the last large Nissan saloon sold in the EU. It’s not: I had utterly forgotten the fifth generation of 1999. It wasn’t until 2003 that Nissan gave up on the large car market. To be honest, I find the chronology of this car bewildering. Perhaps that is itself emblematic of a car so lacking in identity despite being so often quite good (see our previous writings). As I understand it, the Laurel nameplate was discontinued in Europe in 1989 and the Maxima took over despite being a successor to smaller Bluebird-related cars. And these Bluebirds are not to be confused with the UK-market Bluebird which was a successor to the smaller Nissan Violet also known as the Auster. Are you now as lost as I am? It would seem appropriate to try to do a visual representation of this family tree but I won’t, not today. It suffices to say that the tortuously convoluted genealogy of Nissan’s cars might be indicative of a chronic lack of consistency in Nissan’s product planning. Nissan sells approximately ten cars/carlike vehicles in the EU, none of which is a saloon. Their oldest nameplate is “Micra”, dating to 1982. By way of contrast, BMW sells approximately thirteen cars/carlike vehicles and their oldest nameplate is the 5, dating to 1972 (the 3 dates to 1975). I could go on to look at other brands to see how old their oldest nameplates are but won’t. The point is that Nissan’s stable is made up of mostly new names. Further, the QX replaced the Maxima which replaced the Laurel yet the Maxima was a relative of the UK/EU Bluebird which supposedly replaced the medium-sized Violet. Is that not a car-crash of nameplates? We get out of this one photograph the resultant insight that Nissan has had a hard time creating enduring nameplates for consistently managed, stable platforms. Post-Script: I have actually embarked on making a graphic timeline of the Laurel/Maxima and it involves the Stanza, Bluebird and Primera as well. Clearly, as with the Suzuki Ignis, the genealogy of these cars is not going to be understood in Platonic terms. An example of this would be that for BMW a 3-series is an idea materialised in successive set of iterations with clear commonality from model to to model and across the world. In contradistinction for Nissan there are medium, upper-medium and large classes whose roles are assumed by a variety of car bodies. There is no essential “Stanza”, no true “Bluebird”, nor a true “Maxima”. I think only looking at the car body codes themselves would provide a clear time-line. The nameplates are almost meaningless designations, picked up and dropped as was convenient. The Violet was a half-size bigger than the Sunny and smaller than the Bluebird. My head is spinning. I was not aware of that fact. I´d imaged the Sunny and Violet were much the same car. Without checking on Wikipedia, for what it is worth, the dimensionl differences between the cars must have been slim. I imagine the engines and equipment were different too. This whole things is harder to understand than the causes of World War 1. Just to add some further complexity into the mix, each Datsun had an alphanumeric prefix to the model name. The number indicted the engine size (in cc’s divided by ten), the single alphabetic character indicted the model type. Weirdly, this letter related to the actual name only randomly; sometimes it did, other times not . Here’s the full UK range from the late 70’s. * This name caused much amusement amongst schoolboys and certain motoring journalists. ** This name was never officially used in the UK, presumably because it wasn’t “macho” enough for a sports car. Time for a lie-down yet, Richard? To do that lot any kind of justice would take at least ten hours of careful reading, going beyond Wikipedia but also looking at brochures and period magazines; I suppose to have a reasonable chance of accuracy at a reasonable cost you´d want some Car and Autocars from 1960 through to 1990. That would do the UK but not Europe or the US. I haven´t really looked closely into the matter but I am guessing Toyota, Honda and maybe Mitsubishi had ranges of similar unwieldiness. What prevented the Nissan Maxima QX from having a similar well-regarded reputation for decent handling / drive beneath the dull exterior as its smaller contemporary Sunny/Almera and Primera stablemates during the 1990s to early 2000s? While all could have featured improved styling, perhaps the Maxima QX would have done a bit better had its styling owed a bit more to the smaller Primera? Like so many of the want-to-be upper level executives, the Maxima and QX made one of two possible mistakes in this class. It was too conservative. The other possible mistake is to be too adventurous. B – too radical for many used to offerings from (BMW/Audi/Mercedes). A – too soft for a sporting car. The (BMW/Audi/Mercedes) has much tauter handling. B – too firm for a luxury car. The (BMW/Audi/Mercedes) offers far better ride quality. B – the price and equipment are competitive, the car is not built to the same standard as (BMW/Audi/Mercedes). Even if the (NAME) is all round good value for money and quite good to drive, it is not a (Audi/BMW/Mercedes) so it has no driveway appeal. Granted it could never hope to compete against the top 3 in the segment, yet could imagine it carving out its own niche as an enlarged V6 Primera. Have to wonder though apart from the Vauxhall Carlton/Omega and Senator, Lexus and possibly a few early Infiniti models, the fact many non-top 3 competitors in the segment were FWD (and occasionally 4WD) instead of RWD proved to be a handicap? Bob: given that Audi did very well without RWD, I think it was ultimately perceived quality that drove the victory of BMW and Audi and Mercedes. Sure motoring scribes were fetishistic about RWD, but the public cared very little. If they did care they´d have bought more Senators and Scorpios than they did. The the fact they had RWD was enough of a sales proposition to overcome the perceived quality deficit (which was not remotely bad enough to justify their demise, I feel). It´s hard to say what the other “non-prestige” marques could have done other than take the 20 years required to sell cars exaclty as good as the German three and good in exactly the same way. Looking more closely at Nissan, they were never going to win in the executive class or even a class down with their “all over the shop” approach to models and platforms. 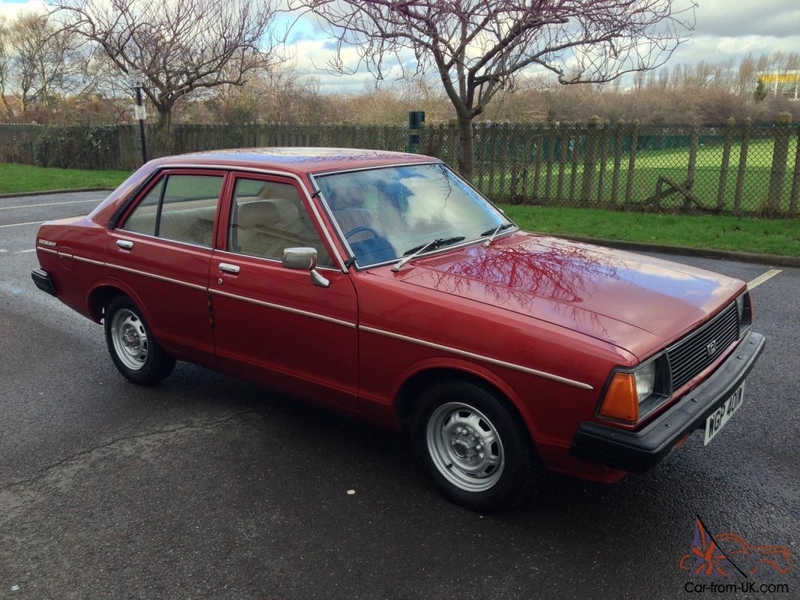 Others such as Ford and Opel were far more consistent and even then that brought only a modest advantage in the time period but looking at the Focus and Astra they have been very consistently pitched for decades and they are in the top twenty. The Qashquai is there too and Nissan must not change that name or muck around with the platform. To be fair Audi could partly thank its rallying success together with its USPs of 4WD (albeit on some models) and 5-cylinder engines as well as even Mercedes-Benz for helping to lay the groundwork in Audi becoming a viable competitor to Mercedes-Benz and BMW. Outside of Infiniti, Nissan could never hope to compete and in some respects the marque reminds me of a reliable Japanese Austin (or what the latter / BMC could have become with better management and investment, etc). Dull styling aside the Maxima QX could have probably been a precursor of sorts to the Skoda Superb or glorified minicab, being to Primera what the former was to the Octavia. Nate: there´s that minicab thing again. Isn´t that tendency for these cars to become minicabs down to them depreciating incredibly? I presume there are no candidates for minicab status since almost nobody sells a massive depresiator saloon other than the big Eurothree. Or are minicabs still Mondeos and Insignias and, from Citroen and Renault and Peugeot, what exactly? Am basically thinking back to 1990s to early-2000s Primera (which did have the reputation for being used as minicabs) and envisioning the Maxima QX being an upward extension of the former as opposed to the dynamically inferior product it ended up being. 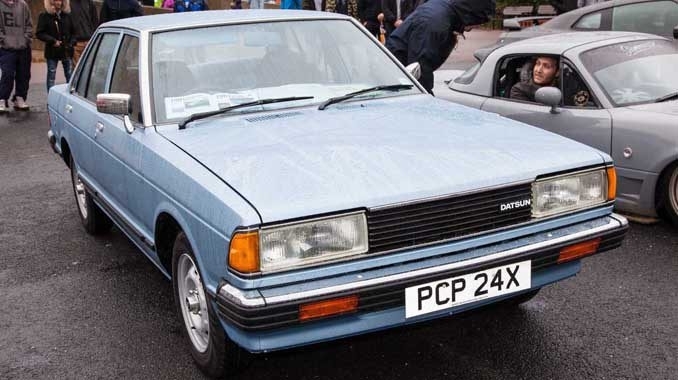 Lack of unique styling or USPs together with the inferior dynamics did not do the Maxima QX any favours, even with the likes of the similar Mitsubishi Galant that was at least available with turbo/biturbo, diesel and 4WD. Nissan’s cause might have been helped if the Maxima QX was as good dynamically as the smaller Primera with the styling of both (along with the Almera) receiving a Pininfarina touch or more (in the manner of 1960s BMC) akin to Peugeot during the same period (via the 306, 405/406 and 605). I have a solution to the Nissan timeline: find all the name plates and put into the those groups all the cars that have used the name and when. I´d need some images of the cars and a matrix of the names. A further complication is to deal with which market because so often a Stanza in one market is sold at the same time as something else in another market. I wonder if this even a solvable problem. Those Japanese market cars with names like 810 and 610 may not have been sold as such. It´d certainly require a lot of time to resolve. A Venn diagrame would nor work becuase it has no time dimension. By the time you’ve worked out what’s what in this list, you’ll have pushed up aeons of daisies, Richard. That list is so intractable I don´t even feel like bothering. The Nissan-Datsun case is more do-able. Why would I want to do this? Because no-one else has, I suppose. I find it interesting that up until a few days ago my model of how car lines evolved over time was incomplete. It´s Eurocentric, based on my understanding from twenty years ago. Next Next post: Just Be Yourself In Front Of The Camera!